Readers can add their own comments to specific paragraphs, arguing with me, al‑Juwaynī, and one another. Like many medieval textbooks, it takes the form of a commentary on a short handbook, Imām al‑Ḥaramayn al‑Juwaynī’s famous Kitāb al‑Waraqāt fī uṣūl al‑fiqh. Its approach is more critical, however. It does not just repeat classical explanations and examples, but asks contemporary questions about epistemology, ideology, and ethics. Consequently, it may hold some interest for specialists as well as students. It is based on a new English translation of the Waraqāt, which is itself based on something surprisingly novel: a critical edition of this oft-republished text. Comments posted by readers will help shape a future print edition. David R. Vishanoff. 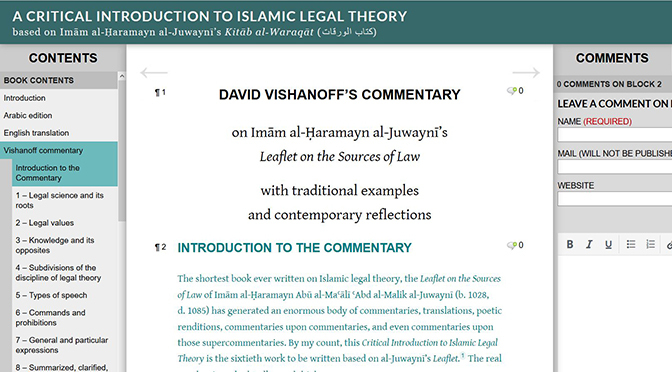 A Critical Introduction to Islamic Legal Theory: A Critical Edition, English Translation, and New Commentary on Imām al‑Ḥaramayn al‑Juwaynī’s Leaflet on the Sources of Law (Kitāb al‑Waraqāt fī uṣūl al‑fiqh). Published online March 3, 2017, at http://waraqat.vishanoff.com. Please share the link with students and even specialists who might find it useful.